Karen Hubacher, Kenneth Schiano, Grace Mitchell, Darlys Ewoldt, Alessandra Manzotti, Larry Schroth, Catherine Kernan, Shelley Robzen, Vicco von Voss and other visiting guest artists. Click here to read more of Mary McCoy’s review on The Chestertown Spy. noun: the process or state of breaking or being broken into small or separate parts. 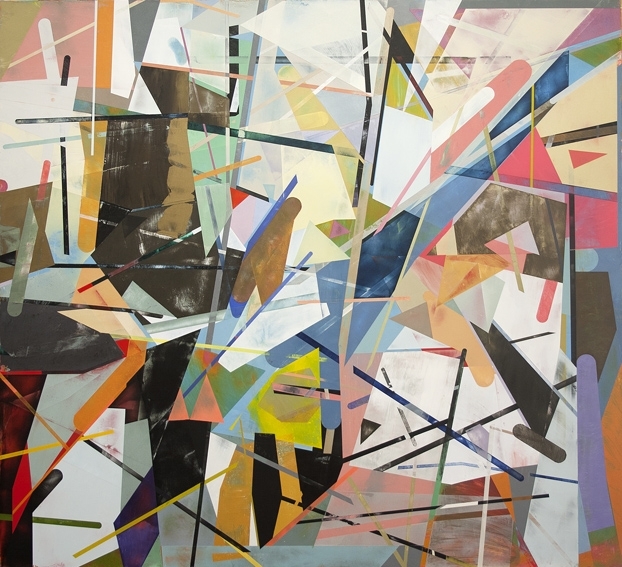 The September exhibition at MASSONIART marks the opening of the Gallery season. 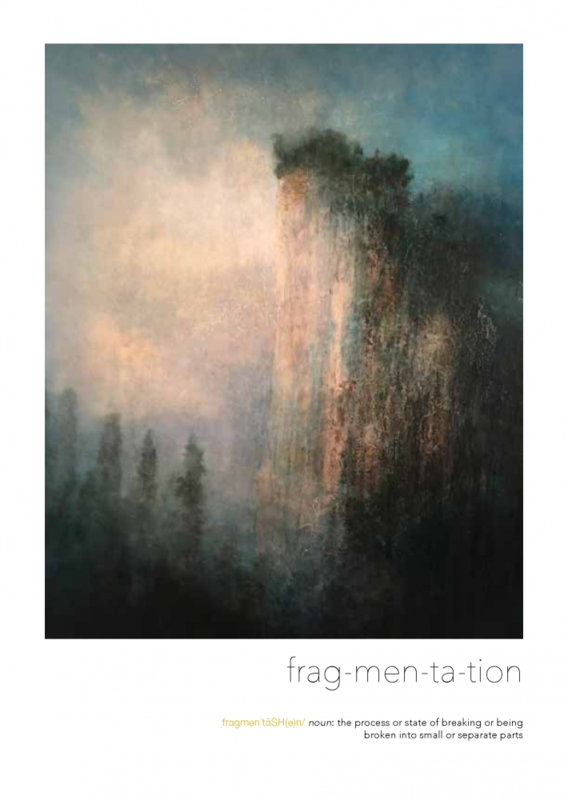 The title, frag-men-ta-tion, selected by gallery owner Carla Massoni, seems appropriate for the challenging times we are experiencing. Gallery artist Grace Mitchell lives and works in the Hudson River Valley. Using traditional oil painting techniques, she makes luminous, romantic paintings of natural places. She works to create a contemporary response to the accelerating deterioration in natural systems worldwide and the fundamental human need for connection to the natural world. 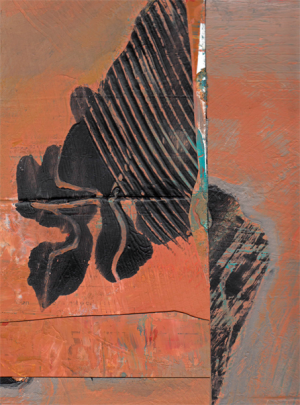 In last season’s exhibit, her paintings bemoaned the destruction of the earth in the quest for coal. This year she felt the need to focus on the iconic role of nature painting and her hope that less despair be conveyed and more inspiration and respect comes through. “The anxiety and fear in the wind these days is palpable and as an artist I am searching for an antidote to that poisonous wind,” she explained. “We are fundamentally rooted in our natural environment, whether we realize it or not, and it is being destroyed at such a clip that it can’t be discounted as a factor in the general fragmentation of our society. Can art play a role? “Can art help restore our roots?” Mitchell asks. 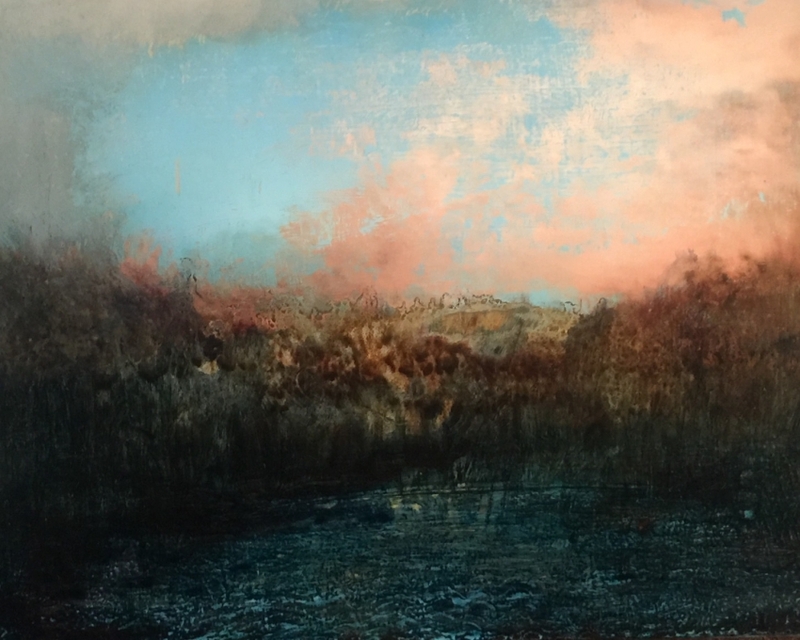 In a recent article, Karen Hubacher’s abstract encaustics were described as having “the poetic effect of landscape reduced to essentials.” Her work emphasizes relationships, rhythm and internal space. When discussing her paintings she explained that, “I think of my work as an antidote to what American activist and author Jerry Mander calls ‘the time-bound, homocentric, mechanical logic’ of our culture…as a respite for the eye and the soul.” Her stated goal as an artist is to make each painting signify a region where a sense of place and a state of mind come together. Personally challenged this year by a devastating fire that destroyed her studio, Hubacher dealt with the ensuing “fragmentation” with the support of friends and family. Can art help restore our roots? For Hubacher, the answer may be a hopeful yes. During the time salvaged from the ruins of the fire and the demands of insurance adjustors, she was able to focus on the creation of new work for this exhibit – perhaps providing just the antidote she needed. Chicago based sculptor Daryls Ewoldt is exhibiting her patinated copper vessels with the gallery for the first time. 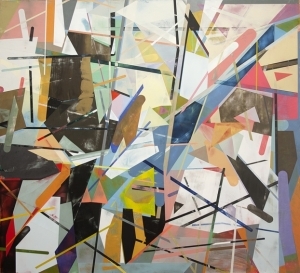 The theme of fragmentation is especially resonant for Ewoldt. In her artist’s statement she writes, “fragments of thoughts, memories, and interpretations of physical objects converge to influence and realize my work. I am intrigued by the mystique and secrets of interior spaces.” The physical process of manipulating and transforming flat sheet metal into three-dimensional forms has captivated Ewoldt for over forty years. “Most of my happiest (and sometimes most frustrating) hours are spent working in my studio. I thrive on the entire process of inspiration and problem solving involved in creating art.” For many of the artists in this exhibit, the process of problem solving often entails breaking apart what exists, utilizing new materials and reimagining a new path. Long time associate and gallery artist Larry Schroth, like Kernan, is eager to “exploit any available tool” in his creative process. Schroth is reimagining his work in a series of new archival digital prints. Frustrated in his desire to find a new direction, Schroth began the process of breaking apart work from his earlier series and reconfiguring the pieces in collage format. Not content to simply regurgitate his work in another form, Schroth is using this exercise as a means of rediscovering his artistic roots and forging a path in what he hopes will offer a new chapter in his life as an artist. Alessandra Manzotti is known for her powerful photographic images. Born in Italy, she spent her childhood with one foot in Milan and the other in Caglio, a small medieval town above Lake Como, where she roamed the majestic foothills of the Italian Prealpi. For most of her adult life she lived in California and for the last decade in the Lower Delaware Valley where she began her photographic career. In 2014, she became an American citizen. Manzotti’s ongoing struggle with the pull of her roots in Italy and her life in the United States has recently been exacerbated by both familial and political factors. 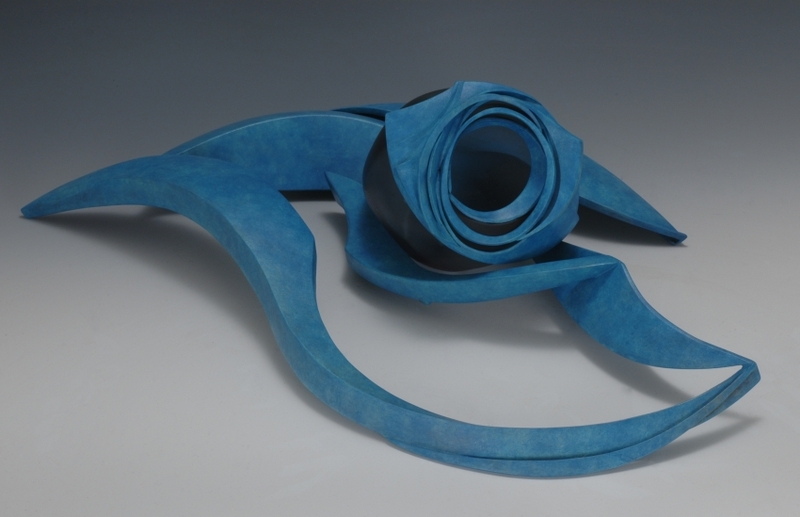 When viewing her work, one experiences the warring emotions clearly confronting the artist. Passionate, heartbreaking, and perhaps ultimately liberating, Manzotti shares her personal journey through her art. This spring, sculptor Shelley Robzen was honored with an exhibition at the Academy Art Museum in Easton, Maryland. A virtual retrospective, the museum showcased both marble and bronze sculptures from all major bodies of her work. Upon her return to Italy, Robzen who lives and works in Pietrasanta spent the summer completing, Dancing in the Clouds #4, the latest Carrara marble sculpture in her eponymous series. Like Schiano, Robzen is an advocate of abstraction and known for the luminous quality of her line. The Dancing in the Clouds series upon its completion will mark the closing chapter in the creation of two bodies of work honoring her younger sister Ellen who died of breast cancer. Through her sculptures, Robzen conveys the overwhelming stages of grief and the final release of life energies to a new reality. “Can art have a role?” The hope of this exhibit is to examine our current reality through the eye of the artist. Their spirit and commitment to evolve may provide the inspiration needed as we search for creative solutions. The exhibition is open Wednesday-Friday from 11-4, and Saturday from 10-5.